Rome was once the centre of the world, still is the centre of Christiandom. The streets of Rome are crawled with churches from different eras and each of those is a jewel of art and history. The Basilica of Saint Peter and the tombs of the popes: built as a shrine for the tomb of Saint Peter it’s the outcome of more than a century of hard work from several architects who shared their wits to build a church over the site of the apostle’s martyrdom. Inside you find Michelangelo’s masterpiece the Pietà he made as a young man at 24. Then Gianlorenzo Bernini’s works: the Baldacchino and St. Peter’s Cathedra as well as Saint Peter’s Square where the Pope addresses the faithful. The square and the colonnade is also baroque art at its finest. 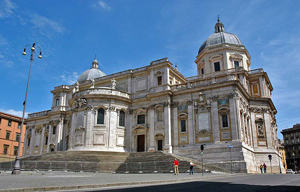 Saint John in the Lateran, the seat of the Bishop of Rome, is the mother and the head of all churches in Rome. It includes the original Baptistery built by emperor Constantine, the relic of the Holy Stairs and one of the finest cloisters in Rome. Saint Paul outside the Wallsis the second largest basilica in Rome after St. Peter’s , built as a shrine for the tomb of Saint Paul which is still visible under the main altar. Saint Mary Major, one of the oldest early Christian churches in Rome, burial place to many popes and of Gian Lorenzo Bernini as well. It is also famous for the relics of the crib of Jesus kept in a reliquary under the main altar. Saint Peter in Chains, built to keep the chains that bound Saint Peter when imprisoned, it is famous also for the powerful Moses sculpted by Michelangelo for Pope Julius II tomb. The Church of the Holy Cross in Jerusalem built by Helen the mother of the emperor Constantine who travelled to the Holy Land and miraculously recovered the relics of the passion of Christ: pieces of the True Cross, part of the cross of the good thief, two nails and the title Pontius Pilate hung upon the cross and also part of the crown of thorns are on display in a glass case in the chapel of the Holy Relics. Saint Praxedesbuilt under Pope Paschal I with its famous chapel of Saint Zeno: a chapel so richly and beautifully decorated in mosaic to be compared to the garden of Eden. Saint Calixtus, Saint Sebastian, Saint Domitilla, Saint Priscilla are the major catacombs open to the public. Those underground cemeteries where used by the Christian and the jewish communities since it was illegal to bury people within the city limits for the hygiene. When the persecutions were over the catacombs became places of worship where pilgrims would go to pray over the bones of the martyrs.